perfect for residential, retail or commercial environments. Electric vehicles are an increasingly common sight at motor shows and on the road. A pure battery electric vehicle, BEV, with a range of around 120 – 150 km, is a good choice for anyone wishing to drive an environmentally friendly and economical car. This type of vehicle is primarily suited for shorter distances, particularly urban driving. With GARO’s outlet box GHL and a 16A fuse, an electric hybrid car can be fully charged in around 3 hours, with a completely electric car taking 6 hours. The charging stations that are being installed in public locations primarily offer charging via the new standardised Type 2 socket. Output varies from 1-phase 16 A to 3-phase 32 A AC. 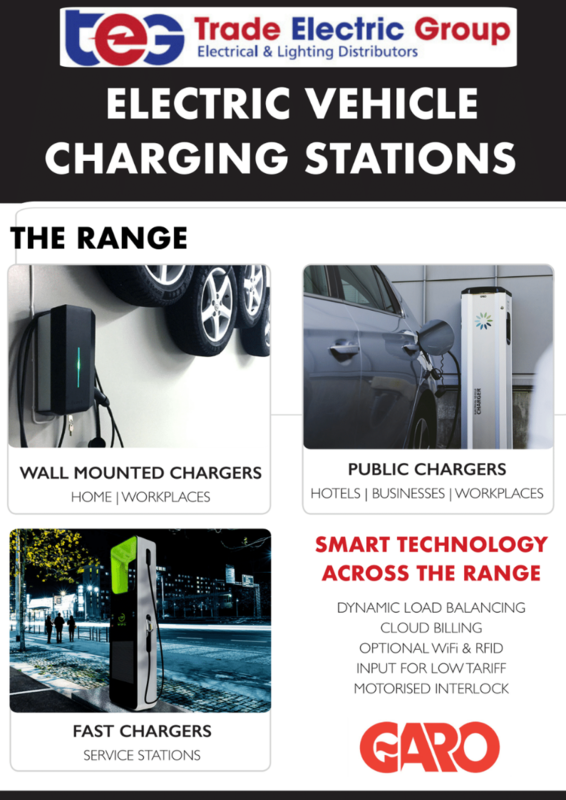 So-called quickcharge stations, which have a power output of up to 150kW, are also being installed in many locations. These use DC (direct current), in accordance with the Japanese CHAdeMO standard or the European CCS standard. 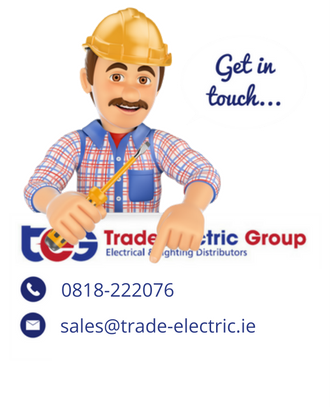 These charging stations are now available from your nearest Trade Electric branch. 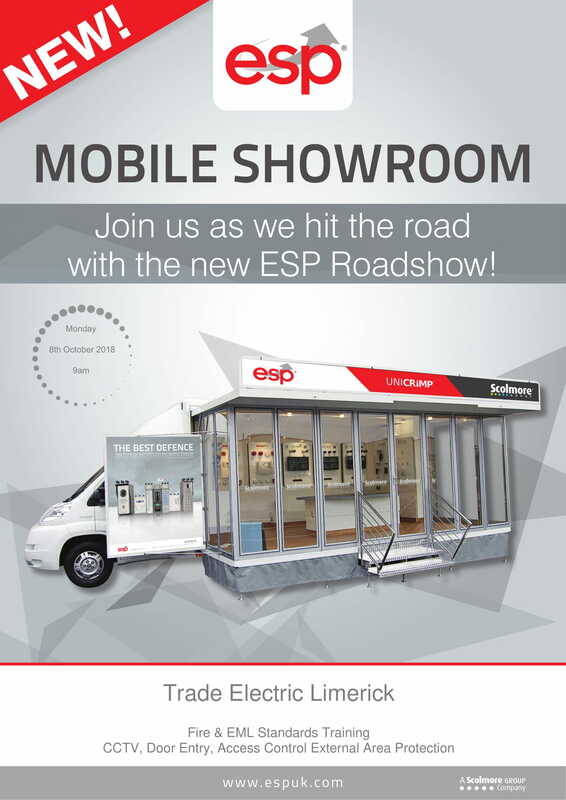 On Monday 8th October 2018 ESP’s mobile showroom will be situated in the carpark of Trade Electric in Limerick for the day. ESP are a leading safety and security product specialist for over 20 years. The company offers a comprehensive range of electronic security and fire detection solutions to meet the requirements of installers and contractors. The range includes CCTV, Access Control, Video Door Entry, Essentials, a growing collection of conventional and addressable Fire Protection products and the newly launched Duceri Emergency Lighting collection. 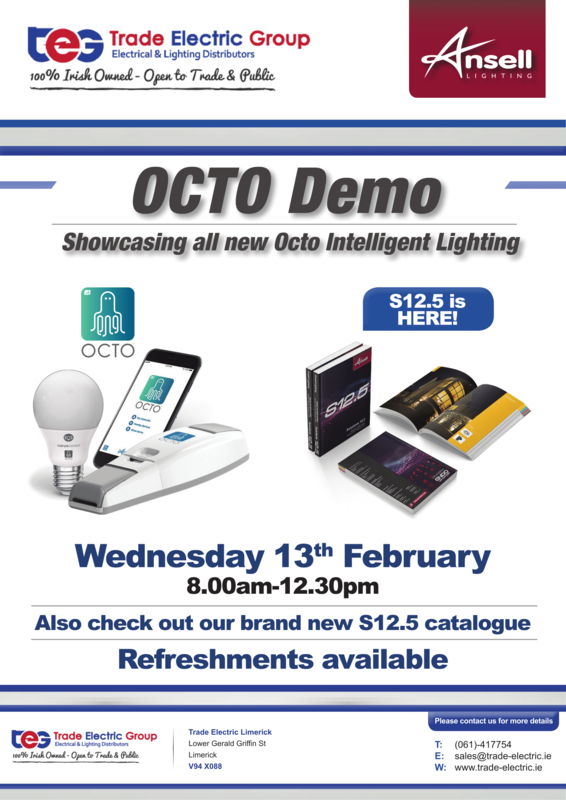 All of these products will be available to see working in their mobile showroom on the day where they will also have highly trained staff on hand to answer any questions you may have. 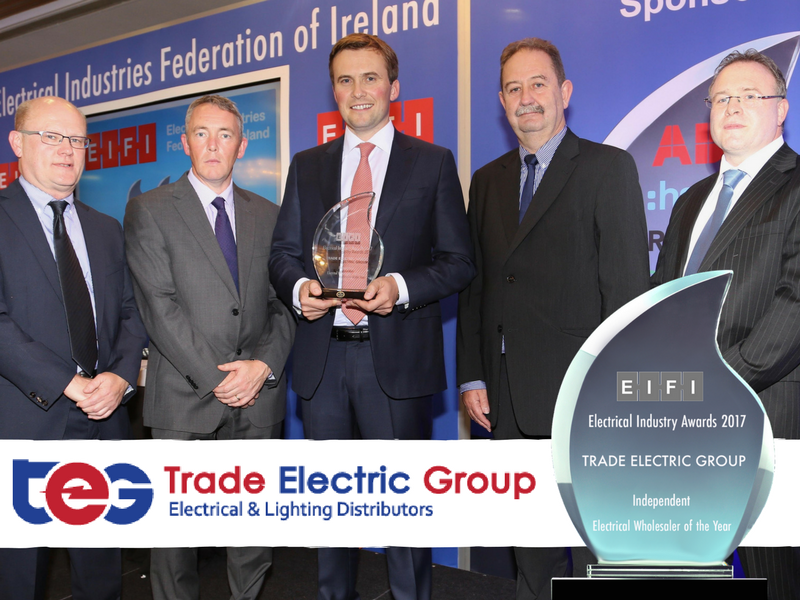 Trade Electric Group won the “Independent Electrical Wholesaler” award at the EIFI Irish Electrical Industry awards 2017. We would like to extend our sincere appreciation to all of our loyal staff and customers who made this possible. It is recognition of our continuous drive to put the customer at the very core of our business which has fueled the recent expansion of Trade Electric Group which has now 8 locations nationwide. Whether you want to create the perfect lighting for reading or a flattering glow for a romantic meal, we have the top tips to make sure you get it just right. Here we will give you some room by room tips to illuminate your life and to ensure you’re not left out in the dark. Each room in your house needs a variety of lighting be it background or ambient lighting, accent lighting to highlight your room’s special features or task lighting for up-close work. 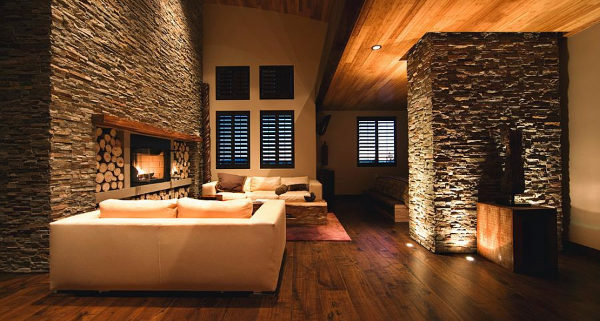 Having bad lighting in a room can make it feel cold, dated and unwelcoming. When updating your room you should be thinking how you can improve the atmosphere with the correct lighting. Think about the purpose of the room, how will it be used primarily, during the day or night? Is it for entertaining, working or studying? One of the most effective and inexpensive ways to change and freshen up your room is through lighting. When making the lighting plan for each room, always consider the activities that take place in the room, how you wish the room to feel, articles you want to highlight and the atmosphere you wish to create. A great place for first impressions, it is a place to make a style statement. Depending on how big your entrance hall is, oversized light fixtures or large chandeliers are two really popular choices. For the smaller hallway, two-tone finishes are growing in popularity. If you have a window in your hallway above the door make sure your light is centered so it can be seen through the window. Ensure the bulb is a warming glow. Place a matching table lamp on a hall table next to a mirror to complete the look. These simple touches are sure to give your entrance a warm and inviting impression. A great place to start is with a centerpiece in your room, an overhead light is essential to the ambiance of the room for any occasion. It sets the stage and gives you the opportunity to consider some other lighting styles. Make a bold statement with a chandelier; it can be a traditional ornate style or a more modern style. Whichever you choose a chandelier will give your room a focal and a talking point. An oversized pendant will allow you to add colour and variety to your room, operating as an artwork on your ceiling. Wall scones are a great way to bring a dramatic theatre look into your living room. Adding dimmer switches will allow you to adjust the light temperature depending on the task you are completing they are especially useful in your living room. You can use each light alone or have them coordinated for when guests are around or dimmed for that cosy time to watch movies. Maximizing the versatility of your dining room takes the right lighting and the best place to start is at the top. Making the light in your dining room the centrepiece of the room is the right way to go, it also allows you to make a statement. If you have a long or rectangular table in your dining room a linear chandelier or multiple side by side pendants running the length of the table is the way to go. A round dining room table can be spiced up with a mini chandelier or staggered pendant light. A dimmer switch is a great idea so lighting can be altered for different mood levels and if the table is used for everyday tasks like homework or hobbies. If you choose to go with a chandelier, you should try and LED light as it can make your crystal sparkle and shine. When hanging a light over your table always make sure you leave a clearway of 30 to 36 inches between the bottom of the lighting fixture and the table top. There is a rule of thumb when picking the size of the lighting fixture over your table. Measure the length and then the width of the room in feet and then add them together. Turn the total into inches and that is the minimum width your over table fixture should be. An area for all functions, eating, working and entertaining. The key to lighting in your kitchen is It needs functional an inviting to make the right environment. If you use multiple sources of light and fixtures this will create a balance throughout the kitchen. This will also add visual interest to your room but minimize glare and shadows. Using a light layering method will improve your room’s versatility. Follow our four must-haves for creating the perfect atmosphere in your bedroom for rest and relaxation. 1) Ceiling Lights with versatile controls for your bedroom provide important total room ambient lighting. Make sure and consider the placement of your light as you may wish for the lights to be around the bed instead of over it. Dimmer switches or remote control lights are a great choice for that little adjustment when you want to relax or watch some TV. 2)Reading Lights are a good choice for the bedroom. One either side of the bed provides suitable light for reading. Swing arm lamps are adjustable and also leave your night stand free. 3)Night Lighting is perfect for the en-suite in your room like LED tape lighting. This type of lighting creates the perfect amount of lighting without that blinding glare during the night. You can also add this tape to the underside of beds or lockers for the same effect. 4)Personal Style there are many different ways to make your bedroom feel like a place to get away from it all. When creating your own little sanctuary in the bedroom, make sure it matches your own style or if it is a child’s room, think about their needs and style. The correct lighting can help you create that perfect place to relax.